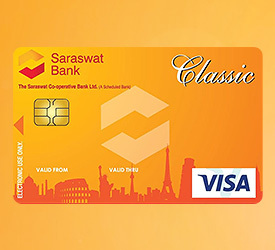 Visa Classic International Debit Card - Saraswat Cooperative Bank Ltd.
Debit card can be used upto the balance available in the account of cardholder. The daily transaction limit for Point of Sale + Online + ATM together is maintained at Rs 50,000/- with a maximum limit of Rs 25,000/- per day for ATM withdrawals. e.g. Maximum withdrawal from Other Bank ATM is Rs 10000/- per transaction with an overall limit of Rs 50,000/- per day.